OAG’s anesthesiologist and pain specialist, Dr. Mark Kallgren is fellowship-trained and board certified in both Pain Management and Anesthesiology. The combination of training and certification in these two specialties means Dr. Kallgren brings a unique understanding to the treatment of our patient’s pain and is skilled in every type of anesthesia and pain medication and care for all types of pain-related cases ranging from neck and back pain, herniated discs, nerve pain, failed back surgeries, complex pain syndrome, arthritis, neuromuscular disease, and other common afflictions affecting more than 65 million Americans. He understands that each patient is unique and comes in search of a solution tailored to meet their individual pain condition. 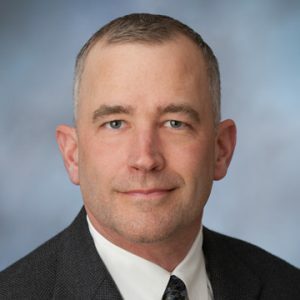 Typically, Dr. Kallgren will provide pain management treatments on-site at either The Portland Clinic Downtown Surgery Center or our Alberty Surgery Center. Questions about your Anesthesiology Bill? If you have questions about Anesthesia billing, OAG’s in-network insurance plans, service and/or treatment quote, or paying a bill, please visit OAG’s website www.oagpc.com.